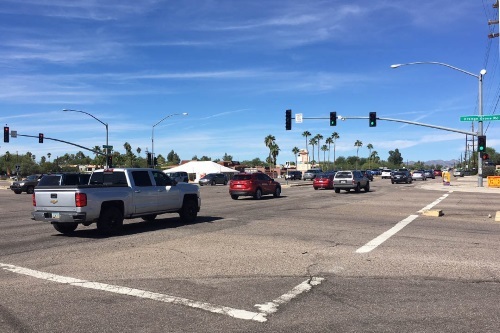 A real-time traffic signal timing adjustment system installed by the Arizona Department of Transportation is helping reduce travel times by roughly 10 percent for motorists along an 8.5-mile portion of State Route 77, the primary north-south route connecting Tucson and Oro Valley. The system, funded by the Arizona DOT and the Regional Transportation Authority, is the first of its kind in Pima County. The agency said the system can modify the length of traffic signal cycles, including left turn signals, and can account for changes in traffic volumes and speeds along State Route 77 – also known as Oracle Road – which carries roughly 60,000 vehicles per day. The Arizona DOT said the technology, installed this summer, shaved two minutes off the typical 20-minute travel time during morning southbound commutes, while northbound travel times have improved by one minute during the afternoon commute and as much as three minutes earlier in the day. The agency added that its engineers are also seeing a secondary benefit: Since signals are timed to the speed limit during non-peak hours, more drivers are traveling at the speed limit.